The title for last Saturday’s ride was suspect from the start: “Keeping it Mellow and Local this weekend, with Just a little climbing”. I think there is exactly one accurate adjective in that title (“Local”). 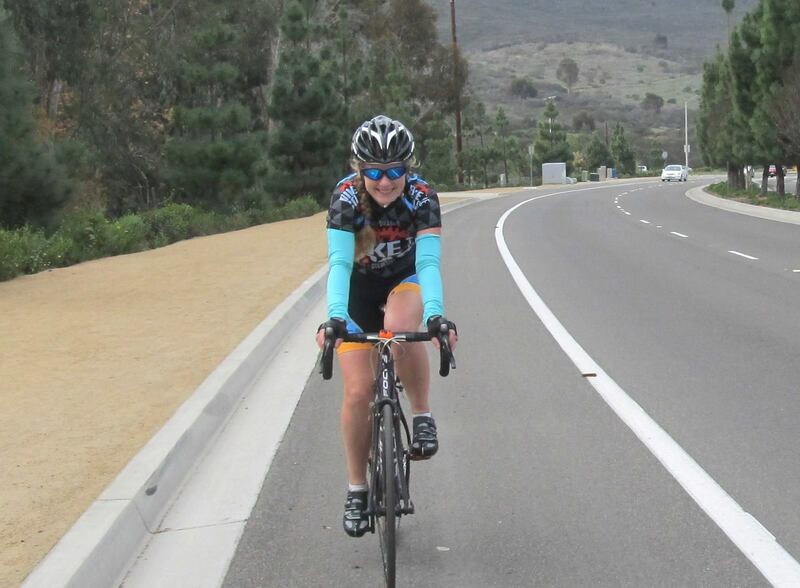 It would seem to me nearly impossible to keep a ride involving approximately 100ft/mile of climbing over 35 miles, and incorporating Double Peak, mellow – but we did our best. 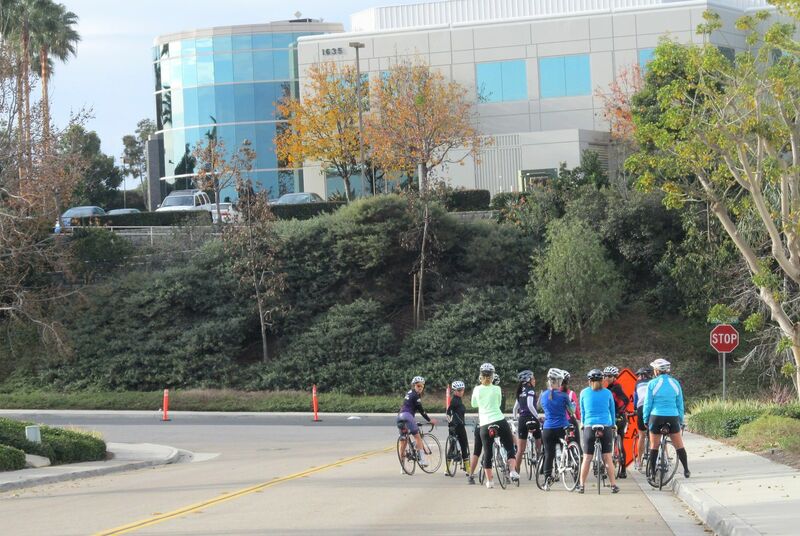 We had a sizable group of 14 show up this past Saturday ready to hit the hills. I have been away from the rides so long, I think I spent most of the intro to the ride mumbling something to the effect of, “That one’s not too bad,” and, “It’s all down hill after that” (it wasn’t). I’m not sure if I showed the fear or not, but this was going to be an extremely challenging ride for me on my recovering body. I think I was trying to convince myself more than anything. 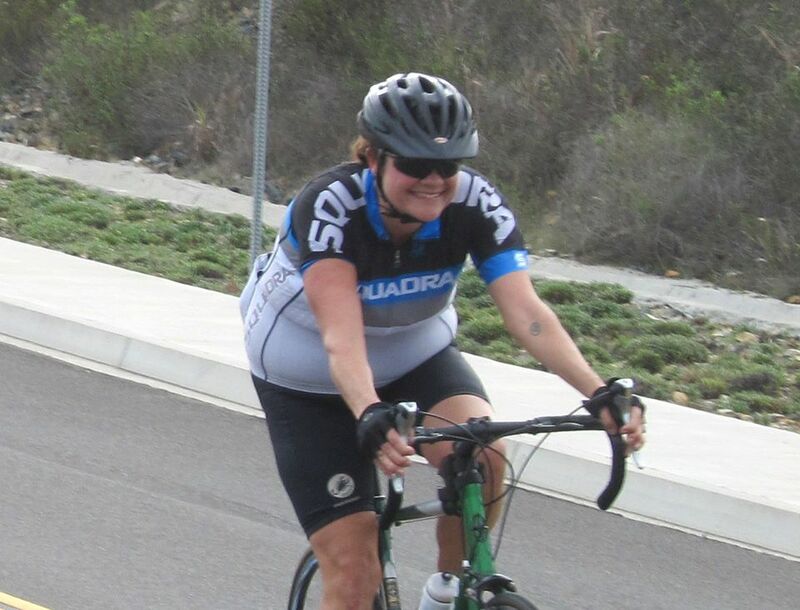 The ride started out pleasantly enough – Jill had routed us along the north side of the Agua Hedionda Lagoon (a favorite connector), allowing for a bit of warm up time. It was still a little chilly, so we weren’t too sad to be approaching our first hill of the day, the Jackspur/Camino Hills climb. At an average of 6%, it was enough to wake us up a bit for the remainder of the ride. Heading inland on Tamarack… looking for a hill to warm up on. — with Ariel Ma, Brielle Wacker and Sian Fogden. 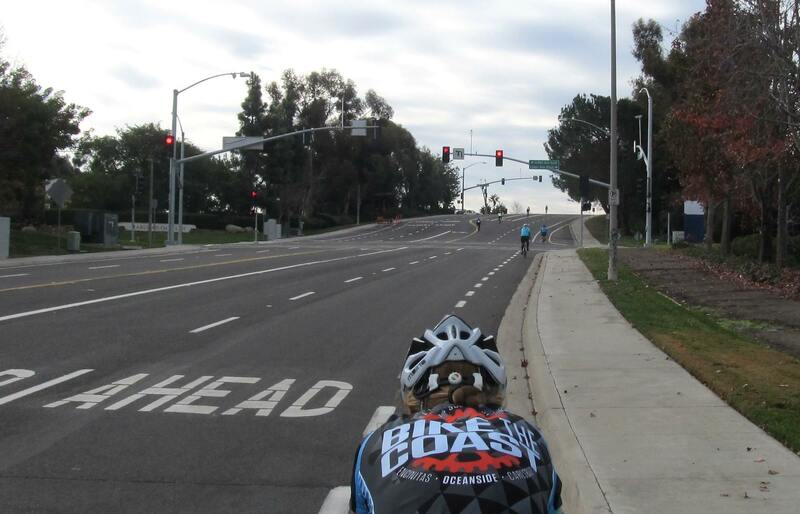 Heather found us a good heater on Jackspar/Camino Hills Dr… — with Heather Bruemmer, Lauran Daugherty, Brielle Wacker, Janice L Huang, Dede Leuthe, Jennifer Rodgers-Wolgast, Tina Wilson, and Laura Acevedo. Jill and I had valiantly attempted to route the group around the traffic on Faraday/El Camino, but I’m afraid we hopelessly failed. The traffic was very light at that time of day, so it wasn’t too bad – but we will probably be avoiding that general stretch in the future. We were trying to save you all from the hill on El Camino, which is much uglier (trust me). 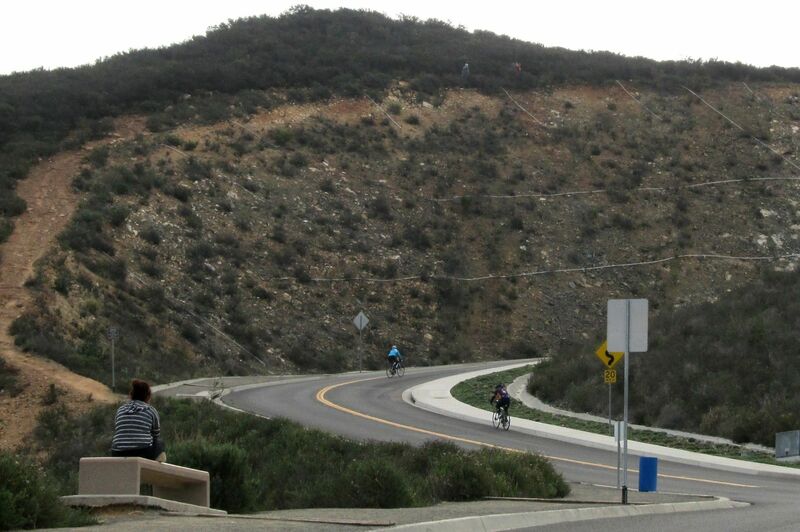 Our next challenge was climbing El Fuerte up to Palomar Airport Road before taking a right onto Melrose and heading for the big hills. Our group stayed pretty much together up through this point. Sian and Michell were sticking to the ‘mellow’ bit of the ride description as they watched the rest of the group make jello out of the Fuerte climb. It was at this point that I started counting the remaining climbs – trouble was I forgot a few. Really, I’m not just a habitual liar – I promise. I was so focused on Double Peak, I completely forgot what was to come after that. Fortunately someone reminded me of some hints about the end of the route, and I got it squared away in my head. I’m a little rusty… it’s been awhile! 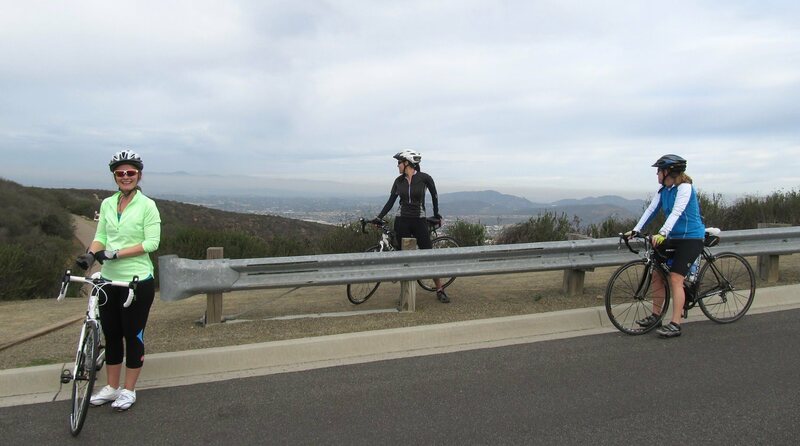 We scrambled our way up Melrose, and had a bit of regrouping before heading out to the big climb for the day – San Elijo Road to Double Peak via Wild Canyon (through the new neighborhood). 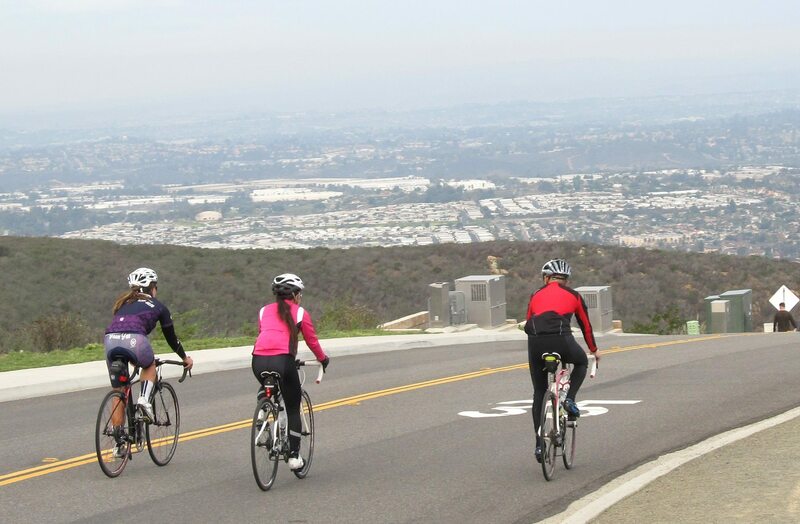 From the town of San Elijo to the top of Double Peak (that leaves out a little of the climbing), it’s 2.5 miles and almost 1000 ft of climbing (average 7%). I was extremely impressed with so many of our group easily topping out on Double Peak – more than one of them were first timers! And of course, we managed to get some great shots up there! 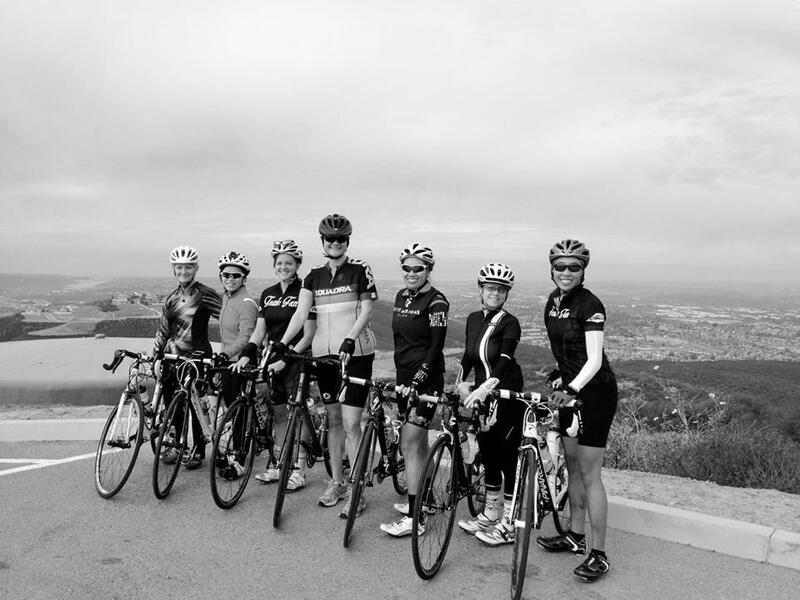 Dede, Ariel, Heather, Melissa, Tina, Lauran, and Janice pose on Double Peak. Laura and Dede – Dede went back down and returned up a second time with Laura. Mellow makes hills happy! — with Sian Fogden. Michell ran into the magnificent trio of Brielle, Jennifer & Suzanne admiring the view off Double Peak Rd. 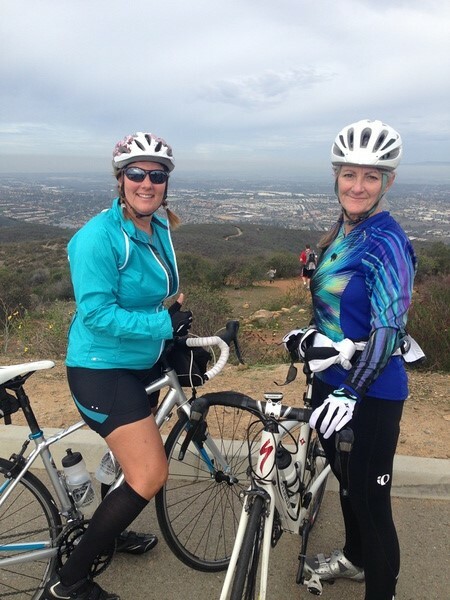 She tried to entice them to give the paved Ridgeline Trail a go, but nobody would bite… Smart gals!! Laura eventually finished the telephone call and rode all the way to the top, of course. That’s how it’s done, folks!! Heather, Ariel, and Andrew enjoying the descent. Lauran spies Michell with her ever ready camera. All that remained after our big accomplishment for the day were a few “minor” hills – here and there, you know, everywhere. Eventually it was flat! We took a “route less traveled” on the way home from San Elijo, following a neighborhood route Jill and Heather sometimes use to get between their houses. 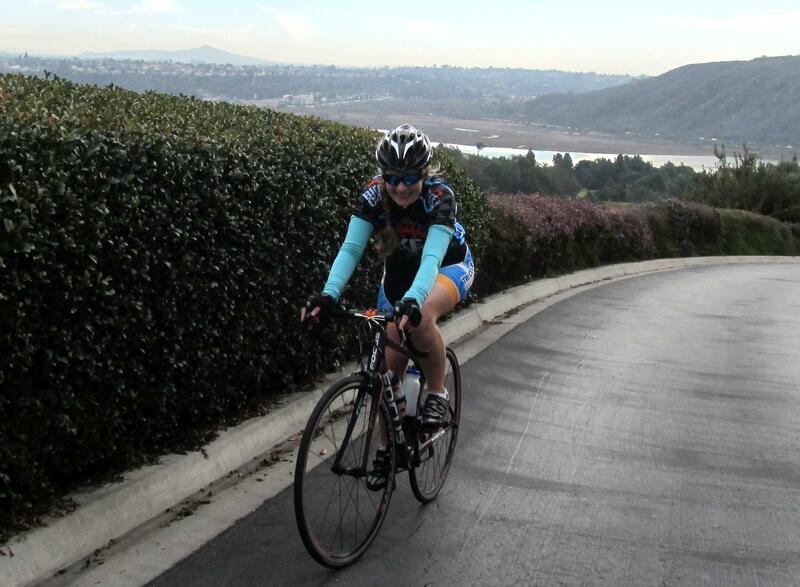 The last main climb takes you up through the Park Hyatt resort in Aviara along the golf course. 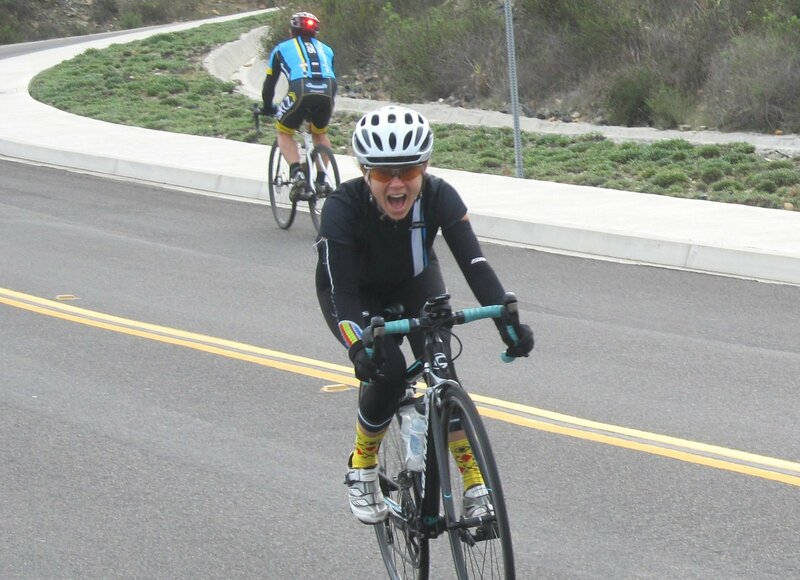 I’m afraid Sian will not believe us anymore when we say things like ‘it’s all downhill/flat from now on’… though she was still smiling near the crest of the Blue Heron Dr climb on Aviara Resort! 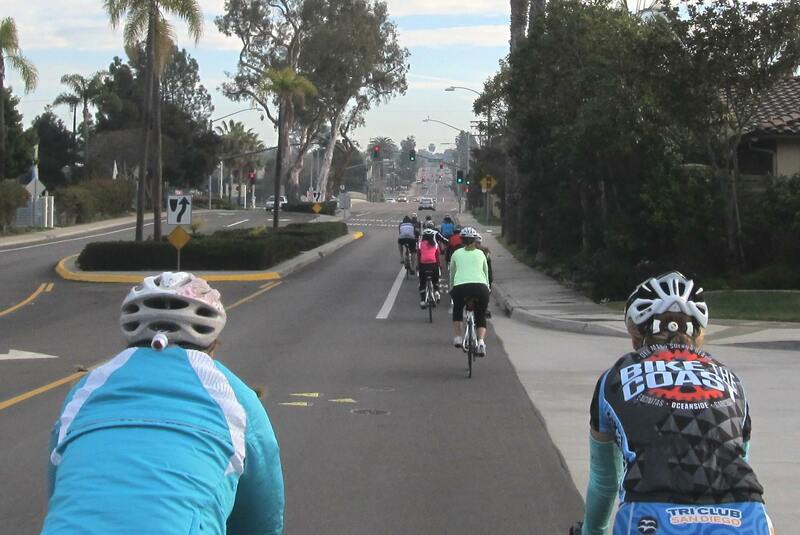 We had a relaxing finish along the coast, and then a well deserved coffee treat at It’s a Grind. 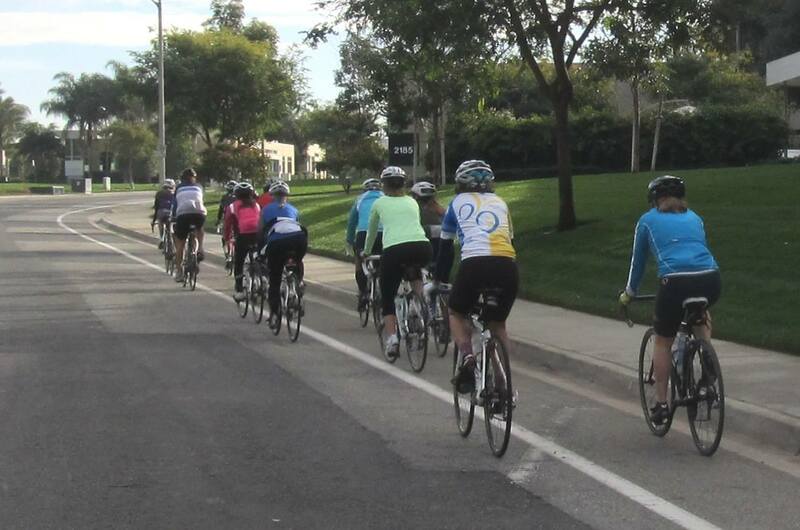 Please join us this Saturday, January 19 @ 8:00 am in Solana Beach (Java Depot) – the weather will be warm and sunny, and we will be meandering on a beautiful route through Rancho Santa Fe, ending with a ride up the coast back to Solana Beach. Sign up on Meetup today! Route sheets are available on the Meetup page if you’d like to familiarize yourself with the route beforehand.